You could call The Chinkees the Asian Man Records 'house band'. Front man/songwriter Mike Park is the owner of Asian Man Records. Bassist Miya Osaki does publicity for the label. And, well, The Chinkees embody everything Asian Man is about - having fun, fighting racism, and playing ska and pop-punk music. 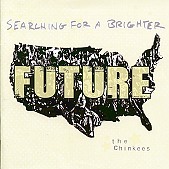 On their third full-length, Searching For A Brighter Future, The Chinkees deliver hook-laden, danceable ska charged up by pop-punk, ranging in influences from Operation Ivy (going as far as to cover "Bankshot") to The Specials. Organ-drenched and refusing to pull punches, The Chinkees deliver a politically alive, fun record that will make you smile, dance, and want to sing along. I'll give it a B+.